The following post originally appeared on the IISC site four years ago. It has been slightly revised and is offered here to help those focused on leveraging “network efforts” with their change efforts to consider how they might shift and align their thinking and actions. This post builds on another focused on the power of asking “beautiful questions” and inspired by a staff challenge to articulate lines of inquiry stemming from IISC’s collaborative change lens, It distills some of the underlying questions that adopting a “network lens” inspires for social change work. Please add, adjust, edit, and rift! How does your organization/network/change initiative strive to add value to (rather than duplicate) existing efforts? What do you do best, and how might you then connect to the rest? What are you doing to support and strengthen connections and alignment within and beyond your organization/network/change initiative? 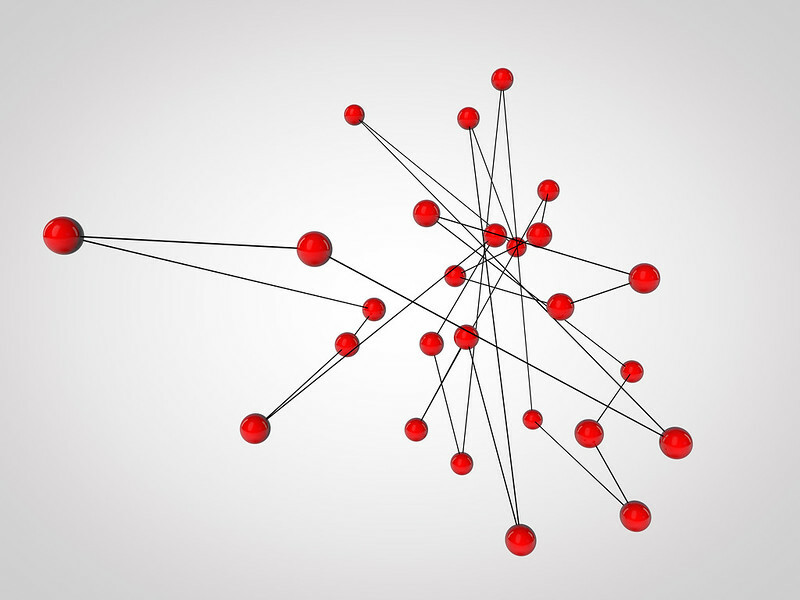 What current patterns of connection characterize your organization/network/change effort? How do these further or inhibit the change that you are trying to be and to bring about? What current resource flows characterize your organization/network/change effort? How do these further or inhibit the change that you are trying to be and to bring about? What current definitions of value (determinations of what and who matters) characterize your organization/network/change effort? How do these align with the change that you are trying to bring about? Who sits at the core of (decision-making, communication, coordination) in your network/ change initiative? Who is more peripheral? How does this arrangement help to bring about (or not) the kind of change you hope to see? What would happen if you drew in or out to those currently on the periphery? How might this happen? How do you currently engage with one another in your organization/network/change initiative? What constitutes “legitimate” modes of knowing, sharing, and interacting? What does this make possible? What does prevent? How might you engage with one another in your organization/network/change initiative to facilitate the best of what everyone has to offer? How are you balancing collaboration and cooperation in your organization/network/ change initiative? When is it most strategic for all or most participants to coordinate (collaborate) around a given action? When and around what is it best to keep things diffuse and self-directed (sometimes defined as cooperation)? How have you created opportunities for mutual and continuous exchange in your organization/network/change initiative? What is the role of empathy in your organization/network/change initiative? What are you doing to nurture deeper understanding, connection, and trust? What is the role of gratitude and generosity in your work? What are you doing to nurture and encourage greater appreciation and abundance? How are you creating space for people to articulate requests and offers and to match these? What structures (governance, decision-making, communication) support the focus and functions of your network/change initiative? It is good to reread this. I am wondering if/how you might amend these questions, crafted in 2014, to be more explicit about race and power. Certainly, they infer these issues so I am curious about the role of making those questions explicit. Great point and question and invitation, Miriam. For sure, terms like “core” and “periphery” may be speaking to power and race. Not always, but often in our work. Perhaps good to invite people to pay attention to when core and periphery are exhibiting divisions and disparity around race and other dimensions of difference that perpetuate structural inequities. Mutuality has to take into account existing inequitable structures that if ignored might make one think more about equality than equity as defining what is “mutual.” Networks that tend to be more extractive in nature certainly can do that as an extension and manifestation of white supremacy (and patriarchy, and corporate capitalism). Supporting connections and alignment can have the important overlay, or backdrop, of asking “Between whom and to what end?” And how does that align with promoting justice and equity, or not? Also, looking at patterns of connection (and flows) can help us to understand some of what keeps inequity and structural racism and white supremacy in place. So being more explicit there would be important. Would love to hear your thoughts about how these might be amended.